And then in the 17th century came the British, with time they tightened their grip on power, monopolised trade and introduced steep taxes with dire consequences. They increased land taxes and brought in a new set of rules under permanent settlement giving landlords an absolute power to rule over the farmers. If that did not suffice they forced opium poppy cultivation on powerless farmers just because there was a huge demand of it in China. They had no empathy for the Indian population and so when drought or monsoonal delays hit they took no measure to avert the brutal results it might lead to. In an agrarian country like india monsoonal delays or natural causes giving rise to loss or scarcity of crops is quite common but the British Govt. dint take any relief measure to help the poor farmers rather their single minded profit driven policy ripped them off all the surplus grains and whatever meagre resources they had. Their inability to pay taxes irritated the rulers further and they increased the land tax to make up for the lost revenue. These drastic measures lead to a series of brutal famines all over India in which Bengal was affected the most. The chiattorer manwantar or the famine of 1770 which went on till 1773 killed approximately 10 million people wiping almost one third of Bengali population. 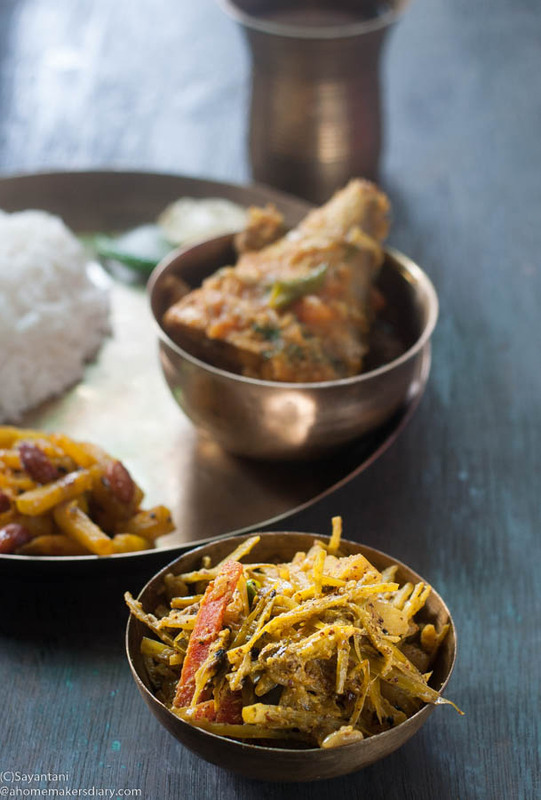 You must be wondering what is the connection between these famines and Bengali cuisine...Well the relation is the introduction of thrift and foraging, the entry of spices like poppyseeds and mustard. 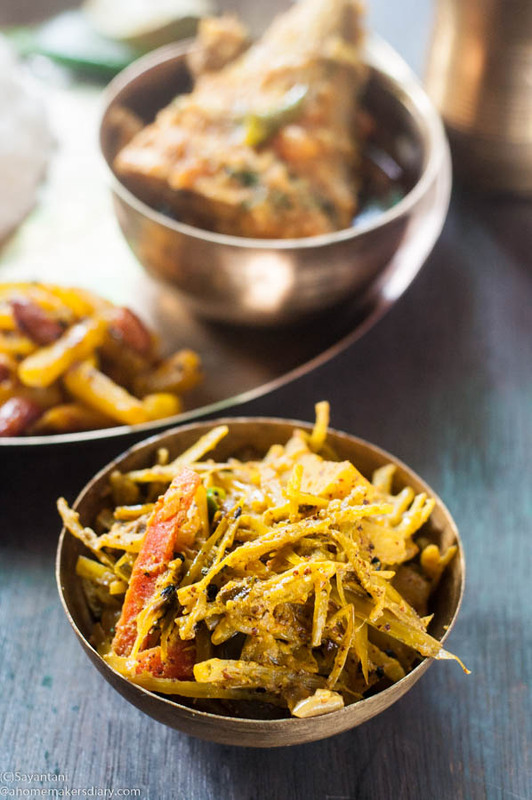 It is said that during those difficult times the women foraged to find local edible herbs and greens, used fish scraps like the gills and bones and vegetable peels to make a dry curry of that using spices like poppyseeds lying in the field after the harvest of opium and the crushed husks of the mustard seeds after oil extraction. Yes the best usage of scraps and waste gave birth to the dish that holds such an iconic space in our culinery repertoire. Today there are as many varieties of charchari as the number of families in Bengal. Almost all veggies are cooked in this specific manner but the most relished ones are still with ingredients that once were considered waste. like the stalks and stems of all sorts of gourd vines, Wild greens such as Malabar spinach, the hard woody stalks of matured spinach or the cauliflower stems. 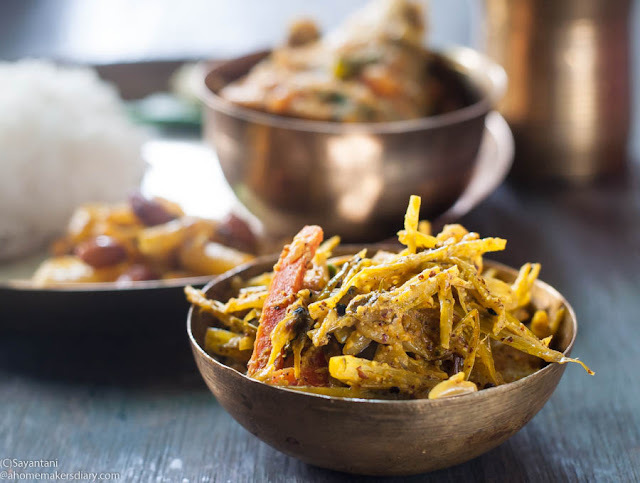 Us Bengali women are tought by our thakumas that when it comes to food, nothing goes waste, there is always a possibility to turn them into delectable charcharis. Just like this Fulkopi danta or cauliflower stalks charchari. Where the stalks cauliflower is sliced very thin and mixed with other veggies and fish scraps to get this beautiful curry. Wash and separate the stalks from the main hard middle part. First thinly slice them and then again slice them to get very thin matchstick like thickness. Soak them in a bowl of water while you prep the rest. Peel and cut potato, brinjal, radish and carrots in 2" batons. Slice onion and keep aside. Heat the oil in a big kadhai and temper the oil with panchforon and sliced green chillies. Let the seeds splutter and turn darker then add the sliced onion. Saute for a minute and then add all the Cauliflower stems. Sprinkle salt and turmeric and mix. Cover and let it cook for 4-5 minutes. Then add Potato, carrot and radish and mix in. Cook again for 4-5 minutes then add potatoes and brinjal. Adjust the salt and let it cook in it's own juice. Stir from time to time. Once the veggies are almost cooked and the stalks are tender add the mustard paste and mix thoroughly. Cook for a minute till the raw smell of mustard is gone then add 2 tbsp of water and mix. Cover and let all the flavours to develop. Keep the flame at lowest. Adjust seasoning and stir it to dry out all the juices. You can also add tiny shrimps in this dish. just marinate them with salt and turmeric for some time and then add them to the pot after you finish sauteing the onion. Proceed thereafter.